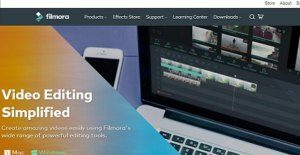 Filmora is a video editing software service built for starters who would like to spend less time understanding the basic functionalities of a video editing software, and focus more on their task of creating and editing videos. With the capability to support editing of videos at up to 4K resolutions, the video editing software is described as very affordable, equipped with both video and audio tools, and provides users many opportunities to apply effects, styles, and customization into their videos. Among the functionalities of Wondershare Filmora are it allows users to add overlays, animations and elements such as GIFs and images, music, as well as texts on their videos especially if they would like to create stories, tributes, and dedications through their videos. A voice over can also be added on videos with this video editing software. Moreover it provides tools that enable users to crop footage, increase or decrease the sizes of videos or fit them all for a certain play time, apply tilt-shift which is used for blurring some parts of a video and emphasize and draw focus to one, adjust video and audio settings such as rotating or flipping videos and removing noises from your videos. One of the most desirable features of Wondershare Filmora is its split screen functionality. With this feature, users will be able to create videos with multiple clips and footage that are played in the same video simultaneously. To do this, users need to select the split screen icon located at the left of Wondershare Filmora user-interface. This icon is found below the other icons of the software for adding files or videos, adding music, adding texts, adding filters, and applying transitions to videos. After selecting the icon, they would be able to see the split screen options from which they could choose how many screens they want and how they are arranged. They could select 2, 3, or 4 screens. After selecting their desired number of screens and their arrangement, they would then pick the video clips which they would use and they have to select them from the timeline where all the clips are located. This is done by dragging the clips from the the timeline to the far left, the split screen inspector will pop up where the clips are selected. When the clips are already selected, for instance, if they want one clip with an audio and none for the other in a 2- screen type of split; they could do that through split screen inspector. Furthermore, they have the option to select which parts of these clips the play would start from. This feature of Wondershare Filmora is very stylish, and enhances the creativity of video editors. Another interesting feature of Wondershare Filmora is its advanced text editing functionality. As an example, users would be able lower the volume of the part of the clip where the text is shown, copy this part with the texts and effects included in it to other portions of the clip, as well as splitting some parts of the clip so users would be able to add texts. Hence, you won’t only be able to add text, but to enhance it with beautiful animations and effects. The text editing tool of the software enables users to edit texts such as making them bold, italicizing, and changing their font size and style. Users are provided with preset text customization, but they could also apply their own customization if they want to such as activating or deactivating the color fill option and adding a border or shadow. This feature is very important, especially when adding credits to a video and it is one of the features of the software that makes video editing more efficient. Wondershare Filmora is also known by its Power Tool. Within this tool, users will be able to change some aspects of a video such as the capability to apply tilt-shift if they would like to focus on one portion of the video and blur the other parts. The Mosaic option of the software, on the other hand, enables users blur specific parts of a video and adjust the percentage resulting to the increase or decrease of the square seen on the part where the blurring is applied. If you are interested in Filmora it may also be a good idea to analyze other subcategories of Best Digital Asset Management Software collected in our base of B2B software reviews. Since each organization has specific business requirements, it is advisable for them to abstain from looking for a one-size-fits-all perfect software application. Needless to say, it would be pointless to try to find such a platform even among market-leading software solutions. The smart thing to do would be to list the various important aspects that require consideration such as main features, finances, skill levels of staff members, company size etc. Then, you should do your research thoroughly. Read some Filmora reviews and check out each of the other apps in your shortlist in detail. Such comprehensive research can make sure you reject ill-fitting platforms and choose the system that offers all the features you need for business success. How Much Does Filmora Cost? Filmora offers several pricing plans to meet the needs of different users. We realize that when you make a decision to buy Video Editing Software it’s important not only to see how experts evaluate it in their reviews, but also to find out if the real people and companies that buy it are actually satisfied with the product. That’s why we’ve created our behavior-based Customer Satisfaction Algorithm™ that gathers customer reviews, comments and Filmora reviews across a wide range of social media sites. The data is then presented in an easy to digest form showing how many people had positive and negative experience with Filmora. With that information at hand you should be equipped to make an informed buying decision that you won’t regret. What are Filmora pricing details? What integrations are available for Filmora? If you need more information about Filmora or you simply have a question let us know what you need and we’ll forward your request directly to the vendor.